The following article originally featured on The National Interest and is republished with permission. Read it in its original form here. About a minute later, Yukon’s AESA radar picked up all ten of the contacts, identifying them as P-800 Oniks anti-ship cruise missiles. The F-35B’s computer immediately transmitted the data to the Truxtun and other NATO forces in the immediate area. Within less than a second, the Truxton’s AEGIS Combat System processed the threat information and autonomously launched 20 SM-2 SAMs towards the incoming Oniks missiles, targeting each Oniks with two SM-2s. Yukon burned towards the Oniks missiles, prepared to intercept. But Overlord was wary of Yukon going “winchester,” or running out of missiles, especially if additional Russian aircraft emerged. About 150 seconds later, the Truxton’s SM-2s reached the incoming Oniks missiles. Four of the missiles struck their targets, but debris from their impact knocked the Truxton’s remaining SAMs off course. Detecting its error, the Truxton’s AEGIS system automatically launched 12 new SM-2s towards the remaining Oniks missiles. “Overlord” ordered Yukon to engage one of the Oniks even though they were nearly out of range. The nervousness in Overlord’s voice was unmistakable. Yukon acknowledged the command, responding with “Fox Three” as one of his AIM-120 Advanced Medium-Range Air-to-Air Missiles (AMRAAM) dropped out of the F-35B’s weapons bay, firing towards the Oniks. 90 seconds later, the Truxton’s second wave of SM-2s reached the remaining Oniks missiles. They knocked two Oniks missiles out of the sky, but four more remained. 10 seconds later, Yukon’s AMRAAM smashed into an Oniks, leaving three. The Truxton’s AEGIS Combat System immediately launched six of its RIM-162 Evolved SeaSparrow Missiles, which were tailored to counter supersonic maneuvering anti-ship missiles such as the Oniks. Within 60 seconds, the RIM-162s found their targets. Two of the Oniks were hit, but a sudden last-minute maneuver by the last Russian missile kept it airborne. Responsible for launching the Oniks, the K-300P Bastion is one of the most advanced anti-ship cruise missile systems fielded. With a range of 186 miles, this system is capable of launching supersonic missiles that can fly as low as 15 feet and conduct evasive maneuvers to counter a target’s anti-missile defenses. Impressed by its capabilities, Russian and Indian engineers used the Bastion’s P-800 Oniks missiles to form the basis for the jointly-developed BrahMos, the world’s fastest anti-ship cruise missile in operation. Essentially, the Bastion not only lets its operators engage distant naval targets, but also allows them to launch advanced missiles capable of overwhelming sophisticated anti-air defenses systems. About 25 minutes later, Yukon was about 50 miles north of Kaliningrad, flying low. Miles behind him, five other F-35Bs had taken off from the Bataan and were en route to join him. It was time to strike back. But Yukon and his fellow Marine aviators would not be leading the strike. That was the job for the Polish Air Force. Committed to NATO, Poland activated contingency plans to scramble a squadron of F-16s to conduct a Strike/CAP tasking soon after Showboat’s F-35B went down. In response to heavy usage, Poland had just upgraded its F-16s to be some of the most advanced aircraft of that type anywhere. Equipped with AESA radars, a next-gen datalink pod, and advanced strike munitions, the Polish F-16s would deliver the punch against Russian forces in Kaliningrad. Specifically, the Polish F-16s were equipped with AGM-158 Joint Air-to-Surface Standoff Missiles (JASSM) that could strike targets as far as 230 miles away. The Polish squadron was split into two, flying “nap-of-the-earth” to avoid Kaliningrad’s Growler SAMs. In support were Bataan’s F-35Bs, which would engage any Russian air threats with their AMRAAM missiles and jam their sensors and communications with their electronic warfare systems. Since Yukon was closer to Kaliningrad, he would provide the Polish pilots with targeting information via a secure next-gen datalink that wouldn’t give away their positions, unlike legacy Link-16 systems. At this point, his AESA radar was switched to passive mode, allowing the stealthy F-35B to fly undetected towards Kaliningrad. When Yukon was 45 miles from the shore, still unseen by Russian radar operators, he powered on his advanced Electro-Optical Targeting System (EOTS). Since the miniaturized EOTS sensor was built into the F-35’s nose, he didn’t have to worry about the sensor eroding his aircraft’s stealth profile. On the screen Yukon steered towards the target into a “bump-up” position. Yukon’s display showed several Growler SAM’s in their “slanted-E” revetments. He was about to confirm the target when he noticed something else—a skinny object standing up. It was an Iskander “Stone” transporter erector launcher (TEL) in firing position. The Iskander, also referred to as the SS-26, is a modern short-range ballistic missile system capable of launching missiles with conventional high-explosive fragmentation warheads, fuel-air explosives, bunker buster, and electromagnetic pulse payloads. Additionally, the Iskander’s maximum range of 310 miles makes it a potent system. But the Iskander’s most lethal trait is its ability to launch nuclear warheads with as much power as 50,000 tons of TNT. In 2015, Russia began rotating its newest Iskander-M systems in Kaliningrad in response to NATO’s renewed commitment to Eastern European defense. Moscow may permanently deploy the missiles to Kaliningrad by the end of the decade. Also troubling, some NATO partners believe that Moscow is secretly stockpiling tactical nuclear warheads in Kaliningrad for use atop the Iskanders. 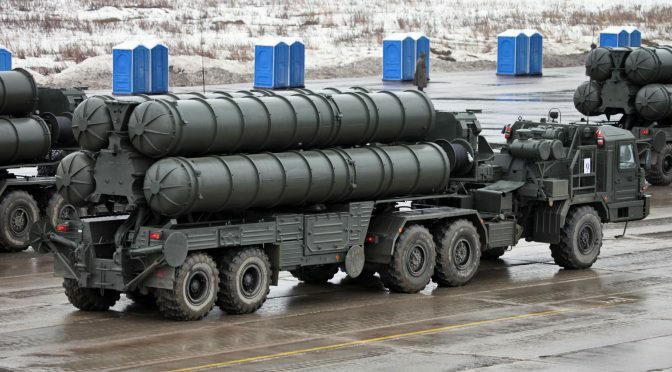 The Kaliningrad deployments were a surprise as Moscow previously used threats to position these missiles in Kaliningrad as a bargaining tool to reduce NATO’s European missile defense deployments. Even though the Iskander is just a tactical missile system, its deployment in Kaliningrad has strategic implications for NATO attempts to “deflate” an A2/AD bubble there. 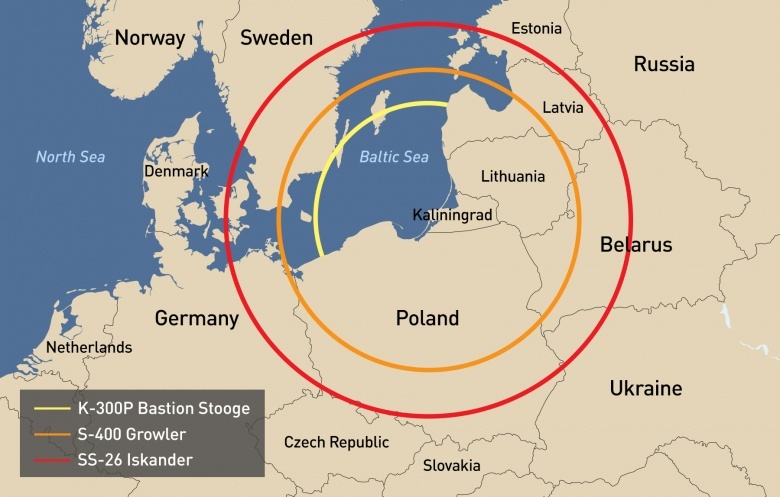 With or without nuclear warheads, Kaliningrad’s Iskanders have the ability to strike an array of key NATO positions in the Baltics. Morever, the confusion whether an Iskander system is armed with conventional or nuclear payloads by itself could foul NATO’s crisis decision making. 40 minutes later, Yukon was just a couple miles away from “Banker,” a Dutch KC-10 Extender aerial refueling tanker aircraft. The joint USMC-Polish retaliatory strike had been called off as pressure from several NATO partners and other states forced the US to step back and resolve the crisis diplomatically. The Russian propaganda machine was in full swing, asserting that its Kaliningrad forces acted entirely in self-defense. Russian Deputy Prime Minister Boris Vorshevsky claimed that Zeus deliberately crashed her F-35B into the Russian Su-30 and that Kaliningrad’s military commanders had no choice but to launch “a couple” Oniks missiles when the “trespassing” US forces turned on their fire control systems. Vorshevsky’s comments were retweeted and broadcasted around the world. Waiting to refuel from the Dutch tanker, Yukon reflected on how close he’d come to attacking Russian forces. All he could think about was that he’d back up flying a CAP the next day and who knew what the Russians had in store tomorrow. Again, this scenario is fictional and some liberties were taken for narrative purposes. As well, the reality of such a scenario unfolding would be even more complex, especially in the political domain. But the point that US forces will struggle to maneuver in new European A2/AD bubbles is unquestionable. “Popping” Russia’s European A2/AD bubbles wherever they may be established is ultimately a tough challenge without easy answers for NATO. Purely surging an overwhelming amount of force into the bubble is simply not feasible due to resource constraints and the risk that Russia would respond with tactical nuclear weapons. However, by making its forces more survivable, the US and NATO allies can naturally degrade the potential effectiveness of Russia’s A2/AD zones and establish some credible level of conventional deterrence. There are examples worth considering for inspiration, such as the US Navy’s Naval Integrated Fire Control-Counter Air (NIFC-CA) capability. NIFC-CA is a US Navy concept using an array of advanced data links to transform a carrier air wing and carrier battle group into a larger network of distributed ‘sensors’ and ”shooters.” Created to counter the air-breathing threat elements of Chinese A2/AD in the Asia-Pacific, NIFCA-CA is a redundant, “networked-enhanced” system capable of functioning even if a handful of sensors are neutralized or jammed. Essentially in NIFC-CA, every aircraft and destroyer is linked directly to each other to make the force more survivable. A NIFC-CA-like capability scaled for the European theater is a crucial step for defeating Russia’s European A2/AD bubbles through neutralizing air-breathers and broadly enabling more effective air operations. Simply, NATO cannot expect to conduct SEAD, CAS, or other types of air operations to ‘pop’ Russia’s A2/AD bubble without removing the air-breather threats. Although critics rightfully point to Russia’s advanced EW capabilities (as demonstrated in the Ukrainian conflict) as a key challenge, this only reinforces the need for NATO to invest in a more networked, resilient force. The “NATO Integrated Fire Control-Counter Air” concept must be service agonistic (e.g., not just a Navy concept, but inclusive of Air Force assets as well) as conflict in the European theater will not solely revolve around the carrier air wing; the appropriate air, naval, and relevant ground platforms should be incorporated. Furthermore, this integrated fire control concept must include the systems of non-US NATO members. In Europe, the US has partners—some of which are positioned within Russia’s emerging A2/AD bubbles—with platforms already in place that can provide immediate support. Challenges associated with information assurance, interoperability, and 5G-to-4.5G communications make developing a ‘common datalink’ a difficult task, but one that is crucial to maximize the effectiveness of NATO’s air assets. Whether it is turning an American US Air Force F-15C/D, USMC F-35B, or Polish F-16 C/D into sensors and shooters networked directly with each other, a ‘NATO IFC-CA’ would diminish the potency of Russia’s A2/AD zones. But ultimately, Russia’s new way of operating in Europe requires the US and NATO to increase their investments in the appropriate capabilities, hone joint multinational operations through regional exercises, and most importantly, assess how their current strategy, doctrine, and tactics match up against this evolving threat. Bret Perry is an analyst at Avascent, an aerospace and defense consulting firm. The opinions and views expressed in this article are those of the author alone and are presented in his personal capacity. They do not necessarily reflect those of any organization. The author would like to thank August Cole, Dominik Kimla, Alex Chang, Steve Ganyard, Jacqueline Phan, and Cate Walsh for their advice and comments. haven’t you heard? A2/AD has been abolished now. we’re back to calling it naval combat, like in the days before the buzzwords took over.